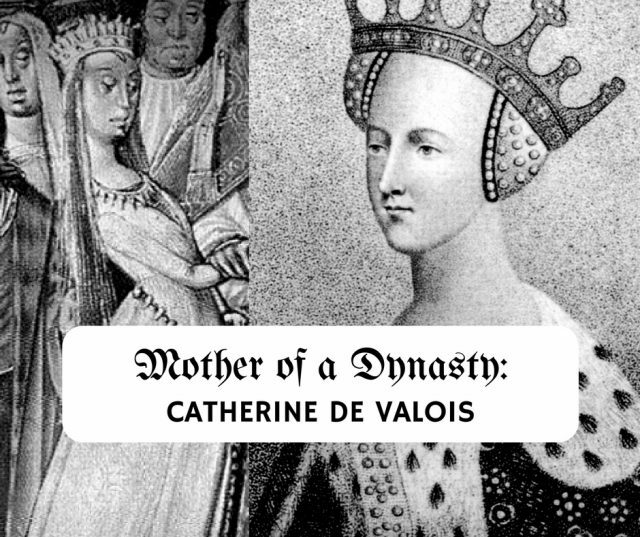 Catherine de Valois was the daughter of a king, the wife and then widow of a king and, finally, the mother of, arguably, the greatest dynasty in English history. Her father, Charles VI of France, despite the fact that he was insane for much of the last thirty years of his life, managed to sire twelve children by his queen, Isabelle of Bavaria. Catherine was born the youngest daughter at the Hotel of St. Pol in Paris on 27 October 1401. The idea that she might marry the future Henry V of England was first muted in 1408 at one of the many abortive peace negotiations between the two countries. Henry was 21 and she, eight, at the time. Nothing came of the proposal. The subject rose again in 1413 but with the death of Henry IV the following year, the matter was dropped. When the young “King Hal” succeeded his father, he proposed that he and Catherine wed and, as her dowry, Charles acknowledged him as heir to the French throne. Naturally the French had problems with this suggestion and, instead of wedding bells, bloody war resulted. Henry invaded France, slaughtered the flower of French chivalry at the Battle of Agincourt on 25 October 1415, and placed himself along side Edward, The Black Prince, as one of England’s greatest medieval heroes. Over the next few years he set about capturing Charles’s kingdom, province by province. Desperate for peace, the French once again raised the issue of marriage. Envoys armed with portraits of the girl were sent to Henry to press the suit and eventually the hero-king met Catherine at Meulan towards the end of 1419. He was at once captivated by her charm and beauty. Her chaste blushes when he kissed her won Henry over. Negotiations took place at Troyes in May 1420; Henry was declared the heir to the French throne and the marriage contract became part of an Anglo-French treaty. The couple was married, not in the grandeur of Troyes Cathedral, but in the small, humble parish church of St. John by the Archbishop of Sens. Catherine was 18 and the King 33. They both entered Paris in triumph in December, sailed to England and Catherine was crowned Queen at Westminster Abbey in February 1421. The King and his new Queen made progress through the Midlands and northern counties of England but by June Henry was back on the continent, leaving his now pregnant wife at home. On 6 December 1421 Catherine gave birth to a baby son, Henry, at Windsor Castle. Almost immediately she left her infant prince in the care of his nurses and sailed to France to join King Henry. They spent several weeks together before she went to Senlis to visit her parents while Henry engaged himself in a siege at Meaux. She was never to see him again. Henry contracted a wasting disease similar to dysentery. Two weeks short of his thirty-fifth birthday, at the Chateau of Vincennes, he died on 31 August 1422. Catherine was a widow at twenty. Just as any mother in her situation, she devoted all her time and energy to the care of her small son. King Charles VI of France died on 21 October that same year thus making little Henry VI, King of England and France. Throughout the early years of the boy’s life Catherine hardly left his side. She appeared in public with the lad when his presence was required and took him to her own estates at Waltham and in Hertfordshire. There was, however, one question that seemed to worry those about her more than it did her. She was young and available – would she remarry? The two most powerful men in the country were the dead King’s brother, Humphrey, Duke of Gloucester, and Henry Beaufort, Cardinal Bishop of Winchester. Beaufort was a branch of that tree that had sprouted from John of Gaunt’s third marriage – he was technically royal but his lineage was tainted with the shadow of illegitimacy. The two men rarely agreed and their constant bickering made government difficult. Should a third element appear in the form of a second husband to the dowager-queen matters would become even more complicated – particularly if he should prove politically active. The wily bishop pressed the suit of his nephew, Edmund Beaufort, Count of Mortain, and, for a while, there were rumours that Catherine and Edmund might marry, but the match fell through. Humphrey gathered enough support to pass a bill through the Parliament of 1427-8 stating that any dowager-queen wishing to remarry must have the consent of the king and that could only be given when he reached his majority. As young Henry was only six at the time, Humphrey had effectively postponed the matter for the foreseeable future. Catherine’s character also gave cause for concern. She was a young, vivacious, beautiful French woman with a lust for life. Indeed, one chronicler describes her as being “unable fully to curb her carnal passions.” No doubt he was a monk! A close eye was kept on the dowager-queen’s activities and those with whom she associated. There was, serving in her household, a young Welshman by the name of Owen ap Maredudd ap Tudur. Owen came from a family who had once held great power in the north of Wales. One of his ancestors, Ednyfed Fychen, had been the right-hand man of Llywelyn the Great, Prince of Wales. Through Ednyfed’s wife, Gwenllian, Owen could trace his line back through Rhodri Mawr (the Great) to the legendary 5th century Cunedda, Duke of Britain. There are numerous myths surrounding the circumstances of Catherine’s liaison with Owen – most of them an insult to the intelligence – so I will not relate them. One tale, however, does have the ring of truth and is supported by an oblique reference in a poem by Robin Ddu of Anglesey writing about the time of Owen’s death in 1461. Catherine noticed the handsome Owen at a ball where, a little the worse for wine, he lost his footing and fell into her lap. The fact that they were very much in love can not be questioned for both ran considerable risks. With Humphrey’s statute in force they could not marry openly so a secret marriage was arranged, probably in 1430-1. The ruling council must have become aware of the match as Owen was naturalised as an Englishman in May 1432. The fact that the dowager-queen was pregnant probably gave the game away! Catherine had four children by Owen Tudor, three sons and a daughter who died young. Edmund was born at Much Hadham, a manor owned by the Bishop of London, while Jasper first saw the light of day at Hatfield on the estate of the Bishop of Ely. The third son, Owen, became a monk and took no part in the future history of England. The marriage of Catherine and Owen Tudor was not public knowledge until after her death. Catherine’s departure spelt trouble for Owen. While she lived none could touch him. He soon found himself in jail. Edmund and Jasper, as half-brothers to the King, were placed in the care of Katherine de la Pole, Abbess of Barking and sister to the Earl of Suffolk, where they were treated in a manner that befitted their status. Owen was eventually released, pardoned of all offences and generously treated by his stepson, the King. He passed much of the rest of his life as a country gentleman. 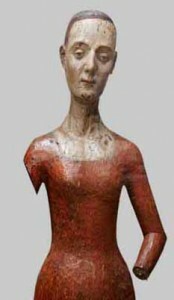 Owen drifted in and out of history after the death of Catherine. At the outbreak of the Wars of the Roses, he is recorded as being present at a Lancastrian Council in 1459 with his son, Jasper, and both swore loyalty to his stepson, King Henry VI. He then made the mistake of getting involved in a minor battle in the Welsh Marches at a small hamlet named Mortimer’s Cross in Herefordshire. Early in the engagement it was realised that the Lancastrians were outnumbered and they broke ranks. Owen was captured south of the battlefield while trying to escape. He was aged about 60 by then and this may have hindered his bid for safety. The Yorkist Edward, now Duke of York after the murder of his father a few months before at Wakefield, wanted revenge for the death of his father and a brother and ordered the execution of the captured Lancastrian nobles. It appears that Owen expected to be released due to his close family relationship to Henry VI, and it was only when he was stood before the block that he realised the end was imminent. While others begged for mercy, Owen Tudor was praised for the dignity with which he conducted himself in death. A contemporary chronicler relates, “On 3 January good Queen Catherine, wife of Henry V and mother of Henry VI, died at Bermondsey Abbey, just outside Southwick, in Surrey. On 8 February she was brought to St. Katherine’s by the Tower of London, and from thence through London to St. Paul’s, escorted by noble lords and ladies, also the mayor, aldermen and guildsmen of London, with a company of canons, priests and friars. After this her body was taken to Westminster, where she was buried with royal honours in the Lady Chapel. God have mercy on her soul. Amen.” And there she rests to this day. Her eldest son, Edmund Tudor, was to become the Earl of Richmond, marry a remarkable lady named Margaret Beaufort, and sire the future King Henry VII. Jasper Tudor was created Earl of Pembroke and proved a most loyal and steadfast supporter of his nephew. Catherine would have been proud of her Welsh offspring. *I have a book, Chronicles of the Plantagenets, that says it was common knowledge that Catherine’s mental state was seriously in question. I am Alan Freer and live in the small village of Byfleet, Surrey, England. Edward, the Black Prince, spent much of his final years in Byfleet. I have been an amateur “historian” since the age of seven, when I purchased my first history book in 1955. Indeed, it was anticipated that I would become a history teacher, but a brief conversation just before I was due to go to university directed me to the banking industry – more lucrative but, perhaps, not so satisfying! History lead me into genealogy and I have my own website detailing the Descendents of William the Conqueror (www.william1.co.uk ). A never-ending project! When I retired from the bank in 1999 I started to write and have had a number of articles published in US history magazines or on magazine websites. Primarily I wrote for the amusement of my colleagues in my second occupation as a civil servant. I count myself most fortunate to have been born in England and would not wish it otherwise – except, possibly, Italy!! Thank you. That was most interesting. I knew the bare bones, but you put flesh to the skeleton. Thank you for your interesting posts. Really enjoy reading them! Most interesting, it’s always good to know more about the major players beginnings. I had no idea that this woman existed! Enjoyed your post. I am an American and love English history. Other then a book , crown in the candlelight by Rosemary Jarman , this is the most I’ve read about Katherine ,and your appears to be historical research vs my book , I believe was more fictional but I enjoyed your article ! Could you please provide the full title and author of the Chronicles of the Plantagenets book you site as the source of Catherine’s mental state? It would be interesting to know the primary source for the “common knowledge” of her health. I’ll leave that for the guest author to answer. Will he see this comment and be able to reply? He should! I will email him. Thank you for providing this valuable piece of history.